The package includes a complete mobile DJ service with professional sound and lighting.The DJ has over 20 years experience and will be sure to make your night a huge success. The DJ will play a mixture of current chart hits, christmas classics and hits from the 60s, 70s, 80s and 90s. This mechanical ride is similiar to a bucking bronco. The pudding will start to slowly buck and spin, gradually speeding up into a frenzy to throw the rider off! This ride is not only gripping fun for the riders, but fantastic viewing for all other guests. The DJ can work with the rodeo bull operator, announcing the best ride times (and worst!). Prices start from £500 for a 5 hour hire period. We cover all of Kent, Essex, London within this price. A small delivery charge may apply if you are further away. In addition to everything in the package above, you also get a complete photobooth service with free online gallery after the event of all images. The photobooth is available for use for the full 5 hours. During this time unlimited visits to the photobooth are included. Each time guests visit the booth 4 pictures are taken and 1 print is dispensed. You can add additional prints to this service for a small extra charge. The photobooth also includes a box of fun props. and other christmas props are available. Prices start from £800 for a 5 hour hire period. We cover all of Kent, Essex, London within this price. A small delivery charge may apply if you are further away. 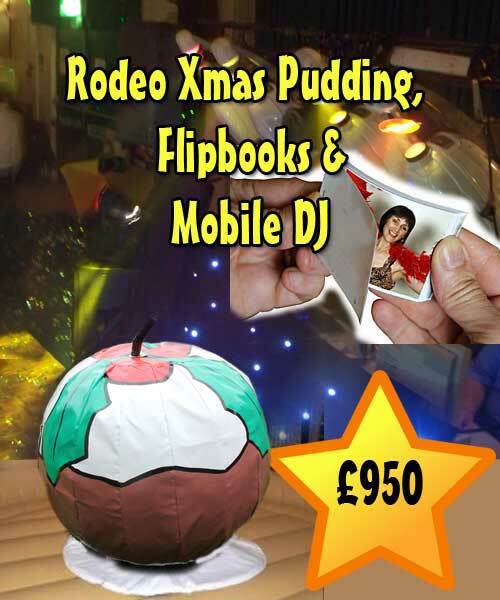 In addition to the rodeo xmas pudding and mobile disco service as listed above you also get our flipbook service. The flipbooks are available for use for the full 5hours. During this time unlimited visits to the flipbook studio are included. Once the clip is recorded guests can preview their recording, if they are happy then the video clip is accepted and printed. Our staff will then collate and staple to create an amazing flipbook for your guests to keep. The flipbooks also include a box of fun props. Prices start from £950 for a 5 hour hire period. We can customize any of the packages to your requirements. We are offering some fantastic discounts for packages. Up to 30% off our normal prices for the December period. Make your office christmas party an event to remember. Make your private christmas party an event to remember. We provide a range of entertainment services for Kent, London, Essex and the surrounding areas. Browse through our website to see what else you could add to your christmas party. 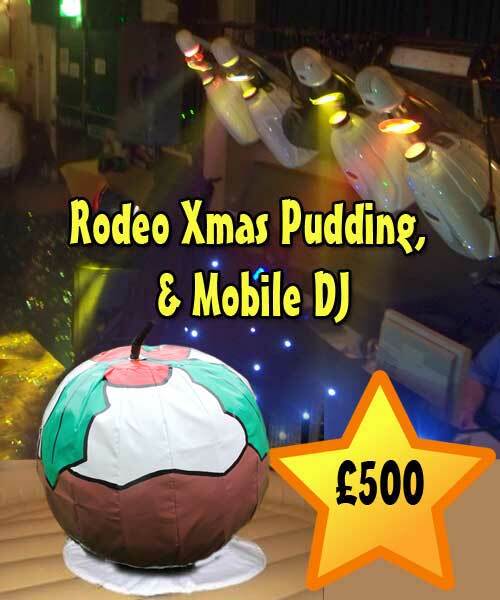 We offer some fantastic deals when booking the adult rodeo bull and kids together. Or for a complete western package why not consider adding the childrens country western theme bouncy castle, cowboy and sheriff themed sumo suits and popcorn. 10 million pounds public liability insurance. Involved in the entertainment industry with hundreds of happy customers including BBC, Asda, Barnados, KFC, HSS, Comets, Cancer Research, Eurotunnel, Guys hospital, Priestfield Stadium, Larry Flynts Hustler Club, Bar Med, Crush Bar, Rat & Parrot, Slug & Lettuce, Yates Pub and many more private functions. Offering very competitive prices. We believe we offer the best value pricing in the Kent area. Our aim is to ensure you have a fantastic party. We can help whether you are having a small garden party, hiring a large hall or if you are a local pub trying to increase your trade. We can also help if you are a corporate and looking to come directly to an entertainment company, we are not an agency and own all the hire items you see listed here. 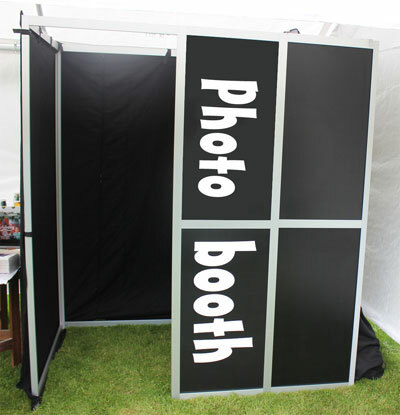 Photo booth hire recently added and is proving to be a fantastic addition to your party. What it looks like: The photo booth is larger than a standard passport photo booth, accommodating up to 5 guests at a time. The outside front of the booth is covered in gloss, black panels with stylish aluminium edging. This booth is unique as it was custom built for us giving it a luxurious hi-tech look. The inside of the booth contains a touchscreen display showing you a live preview. The photos are printed on 6x4 photographic paper using a dye sublimation printer. That means they are instantly dry and won't fade giving you the best quality prints. You can choose a line of text to accompany the four images on each print. We also have an all weather outdoor marquee style booth. How it works: A booth attendent helps your guests choose props* from our big box of specially selected fun items, from sparkly hats and feather boas to fun sunglasses, face masks and wigs. Once inside, the guests get settled and the booth attendent explains the simple process. Four different photos are taken with a count down between, the guests get to see each photo on the sceen in front of them before the next one is taken. The photo booth takes 10 seconds to print each copy (one of the fastest available!). The guests collect their picture from the booth. After the event: 5-10 days after your event you will receive a CD/DVD of all the images collected at your event which you can keep as a momento. Images can also be uploaded to your own private gallery page on a dedicated website. You will be provided with a password so your images remain private to you and any guests you share the password with. You and your guests can download images from your private gallery page and use them however you wish such as uploading to your Facebook page or emailing to your friends and colleagues. Use of props (feather boas, policeman hats, celebrity face masks, sparkly hats, masks, props etc) depending on package. 2nd set of prints and guest book: As guests exit the booth the attendants encourage them to insert a copy of their photos into a guest book and write a message leaving you with a great momento of a fabulous evening. We provide a choice of black or patterned guest book as standard but are willing to search for something specific if you require it. Additional Sets of Prints: If you want your guests to have more copies of each picture then we can set the system to print up to 4 copies each time guests visit the booth. 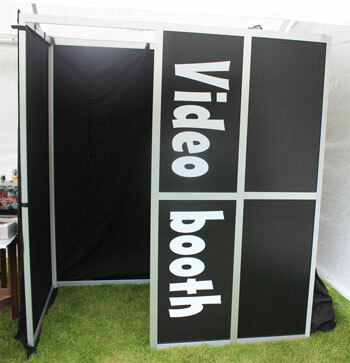 Video Recording: The booth can be set to not only take pictures, but also to allow your guests to record a 15second video clip. All this video clips are recorded onto a DVD and sent to you as a momento after the event. External Monitor display: We can add a second monitor outside of the booth to display all photos that have been taken during the night. This encourages people to use the booth and is great fun for everyone. Our managed services all include a trained operator who will deliver, setup, manage and pack away with care. The disco package is attended by a professional DJ with over 20 years experience. Some services such as the sumo hire, gladiator duel, bouncy boxing, pillow bash, pole joust, bouncy castle can be simply delivered to you and collected at the end of the day or if required, can include an operator. We can combine services to make a fantastic memorable night. 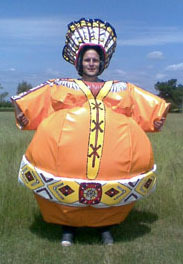 For a unique twist why not add sumo hire to the disco for your birthday party. We can put together some great discounted packages. Whether you are a large corporate (we have supplied to the BBC) , SME, local pub and want to hold a party we are here to help. Browse through our range of party services using the links above. 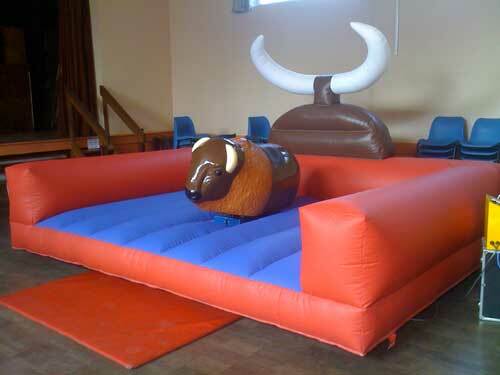 Our 15ft x 12ft country western themed bouncy castle is great fun for 3-1 2 year olds. This makes the perfect addition to the rodeo bull hire. Something for the younger children to enjoy. Our bouncy castle is top quality and is made in the U K.
Combined Rodeo Bull and disco- Unique combination and fantastic fun. The DJ will mix up all your favourite tunes with some country and western party tracks. Encouraging the audience by announcing the longest bull ride times and running competitions. A trained operator will operate the bull and work with the DJ to ensure a great night is had by all. A trophy will be awarded to the winner of the rodeo competition. Create you own unique combination or themed events- We would be more than happy to combine multiple services to your requirements. 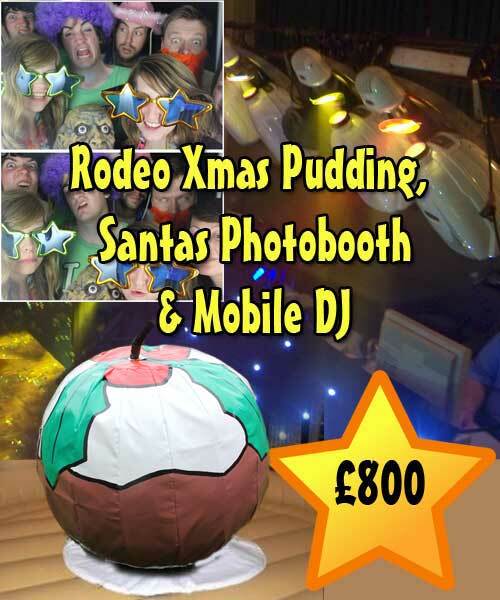 For example we can offer a complete country and western night with rodeo bull, Saloon Bar Shoot Out and mobile disco. Or how about a sumo wrestling and gladiator tournament. 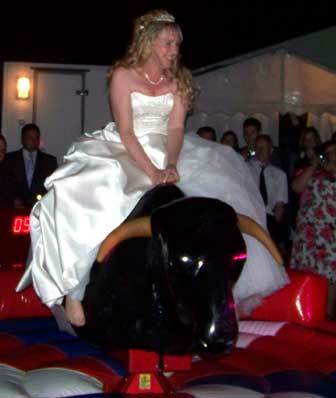 Add something unique to your wedding day with a rodeo bull. All combined packages are available at reduced pricing.